Let’s face it: the internet isn’t your typical advertising medium. When embraced, the internet can create powerful (and profitable) experiences that rival traditional marketing mediums (TV, radio, print). Unfortunately, there are quite a few business owners that seem to have a tough time differentiating between these two approaches to marketing. On one hand, you have traditional media. There’s nothing particularly wrong with traditional media—it just happens to be a primarily passive experience. Just about every attempt to make it a truly engaging process has failed. For better or worse, the average consumer has come to expect a certain experience from watching TV and listening to the radio on the way home. The internet isn’t a passive experience. That’s one of it’s biggest selling points. You’re not just watching information fly past you online; you’re actively choosing what you want to see. Passive content doesn’t work because the bar of stimulus has been set WAY too high online. Everyone knows that you need to create “engaging” content, but most digital marketers and small business owners tend to trick themselves into thinking that their self-promotion is creating a dialog with their audience. There’s this myth that if I write in perfect prose, use the right content marketing tools, and socialize on social media, then I’ve done by job. Let’s be absolutely clear: Having social media widgets at the bottom of your article shouldn’t be the main way you try to engage your audience. Until you’ve established a foothold in your particular industry, you’re going to be fighting to keep your audience’s attention. Think about all the distractions that you deal with every time you turn on your computer. It’s pretty intense, right? Forget about the benefits of putting on a show to keep your audience interested. There’s something to be said about creating a unique, interactive experience that your audience can’t get anywhere else. Will it help you stand out? Obviously. But more importantly, it’ll make the information easier to absorb. So how can you entertain your audience, make tired material interesting again, and keep your content from falling into the “passive trap?” Interactive content is your best bet. Everybody knows those infamous BuzzFeed quizzes. Whether you love them or hate them, they’re popular, entertaining, and can be educational without boring their audience to tears. While quizzes might be one of the more trendy things to do now (considering the ridiculous success they’ve had), they’re far from the only way you can truly engage your audience. For starters, infographics have the unique ability to make tired topics seem fresh and exciting again. A truly interactive infographic can be made with embedded questions, various paths for the reader to follow, and a variety of other features that encourage participation from your audience. Take the topic of social media and The Complete History of Social Media animated infographic created by Avalaunch Media. This infographic uses Flash to show you a quick overview of the history of social media and, in the process, shows us the foreseeable future of interactive infographics. Remember how we mentioned that you’d have to fight for your audience’s attention online? Animated GIFs are one of the most effective ways to do that. Beyond being eye-catching, the animation has all the benefits of video without turning the content into a purely passive experience. It’s a small burst of energy that just might intrigue your reader enough to keep interacting, posting, and purchasing. Just look at how Starbucks caught the attention of their Twitter audience by putting their product in motion. Catch the coffee while you can! When all else fails, contests are a great way to interact with your customers. Everyone loves a prize, and oftentimes the potential to win is fun in and of itself. Our favorite contests encourage customers to participate with user-generated content: share a selfie, upload a video, or submit a tagline. When Warby Parker introduced their Home Try-On campaign, they encouraged potential customers to take pictures of themselves with the different glasses on and share it to their social accounts with the hashtag #WarbyHomeTryOn. Not only were customers vying for a free pair of glasses, but they received instant feedback from their friends and family across social media. Oh, and did we mention Warby Parker received free product advertising in the process? I call that a win-win across the board. 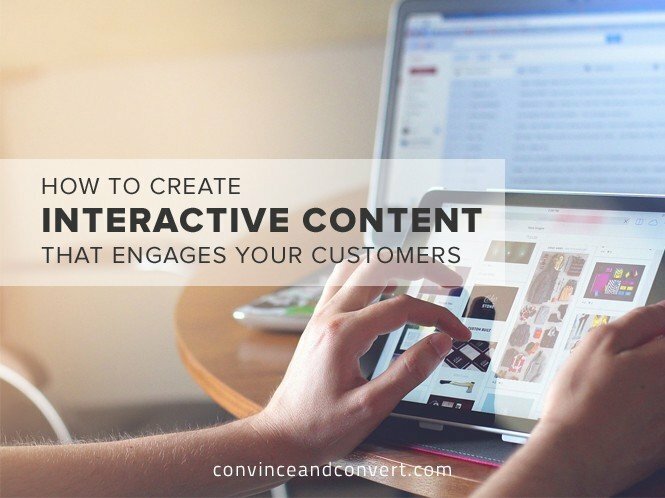 Now, before you dive into creating interactive content, ask yourself a few questions. For starters, what kind of audience do you have? If you have a more professional audience, then infographics are a great choice. They’re filled with plenty of useful data and packaged in an interesting, unique way. When properly implemented, an interactive infographic can provide just as much entertainment as any animated GIF. If you’re trying to target more of a casual audience, learn to embrace quizzes. Not only are they short, sweet, and to-the-point, but it’s one of the easiest ways to learn more about your audience. Still confused about what to do? If you’re truly stuck, take the time to create a poll for your audience and figure out what they like and dislike. If you’re serious about creating meaningful interactive content, you’ll have to put in some serious effort. Think of it this way: You’re designing a product/service to sell, except you give it away for free at the end. You don’t need to pour tons of money into this content—it just needs to be genuinely useful. Don’t underestimate your audience! They can sense your intentions from a mile away.